Happy Chinese New Year! 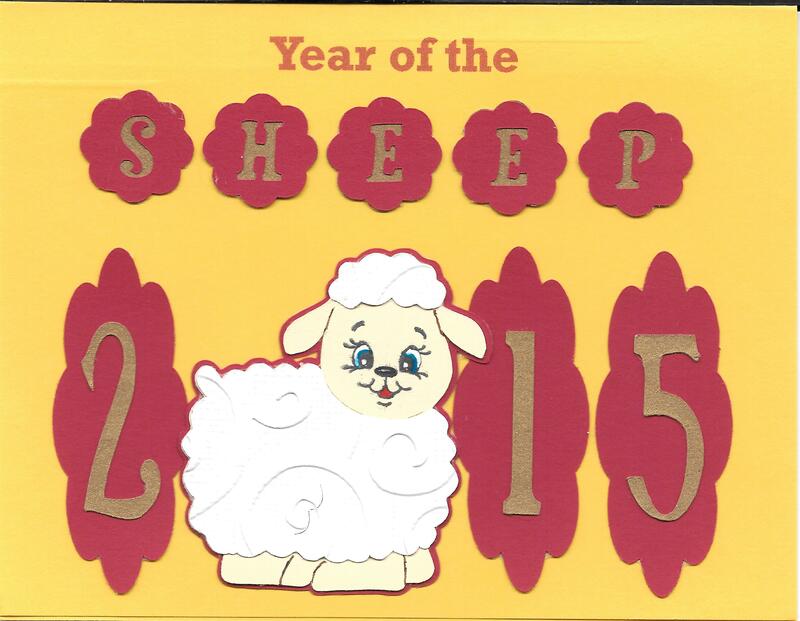 Here is the card I made for my friends this year to help them celebrate the Year of the Sheep. To make this card I cut out all of the images using my Cricut Explore and printed out the heading “Year of the” with my printer. Cuttlebug Embossing Folder – D’Vine Swirls for the sheep’s body and head. Face stamp from – Peachy Keen PK-440 Cute & Cuddly Face Assortment. Liked to share the card I made for my husband this year with you. For the front of the card, I used a design that I found in “Complete Cardmaking – Making Beautiful Cards with your PC” magazine. 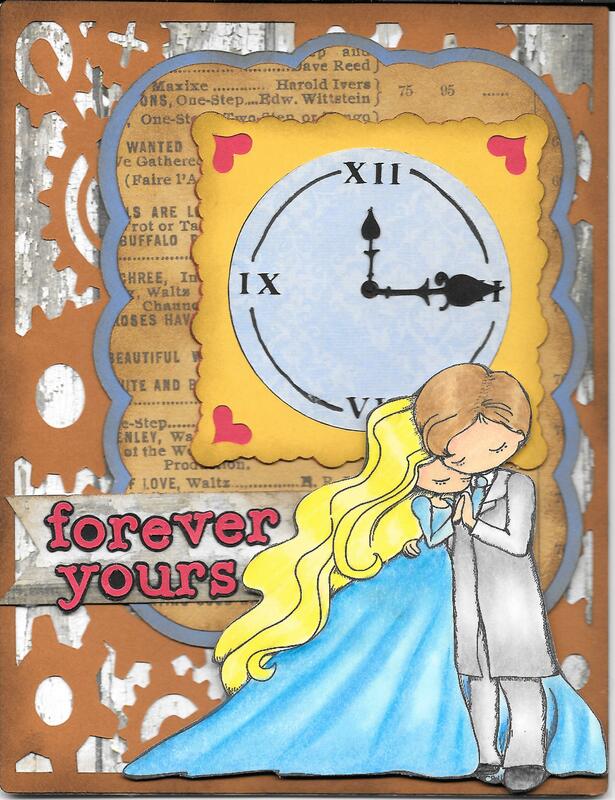 The original design by Nancy Malaka can be found on page 27 and is called “Forever Yours”. I uploaded the .jpg from the CD into Cricut Design Studio for the couple and then used the “Print and Cut” feature to print the image to my printer and then Cricut Explore to cut my image for me. Love this new feature! Next, I used my Copic and Spectrum Noir markers to colour the image. PrismaColor Premier Pencils were used for creating more contrast and shadow. Scrap paper for wood background. Light brown for gears background and went around edges with Walnut Stain Ranger Tim Holtz Distress Ink. Greyish Blue was used for large scalloped label behind clock. Newspaper cardstock for smaller scalloped label behind clock and went around edges with Walnut Stain Ranger Tim Holtz Distress Ink. I stamped the images using Memento Tuxedo Black ink and Peachy Keen stamps from PKS-04 April 2012 for the clocks and sentiments. Cutting them after they were coloured. The faces are from PKS-1357 Sweet on You Face Assortment. 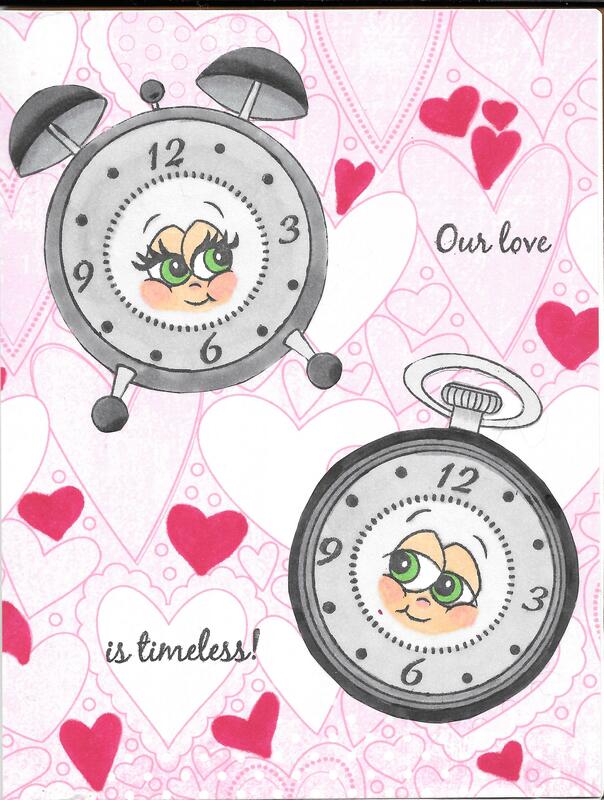 Background paper is from K&C Company Kelly Panacci designer paper, KP Valentine. Copics and Spectrum Noir pens to colour faces and hearts in background. Some pink chalk to colour cheeks.